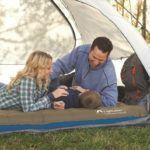 If you are passionate about the outdoors and camping, the coolers are one of your most significant necessities. They don’t just keep your drinks and water cool, but also offers a convenient way to store your catch. You may go camping for days together, or it can be just a day trip, either way, the cooler comes in rather handy and useful. It is one of those must-have gears that can truly enhance the quality of your trip and want you to go again and again. 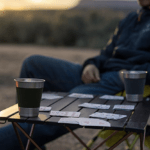 But the question is, how do you decide on the best camping cooler? There are many aspects of the cooler that you need to pay attention to. You also have to concentrate on your personal requirement and objective. Some people may use a cooler just to store drinks, but others may use it to store their catch too. You may have a family of just 4-5 people camping, or on the other hand, you may have a bunch of 12-15 college friends camping/hiking together. So with every new situation, the requirement and objective of the best camping cooler change perceptibly. It is about getting the right fit that serves your purpose best. 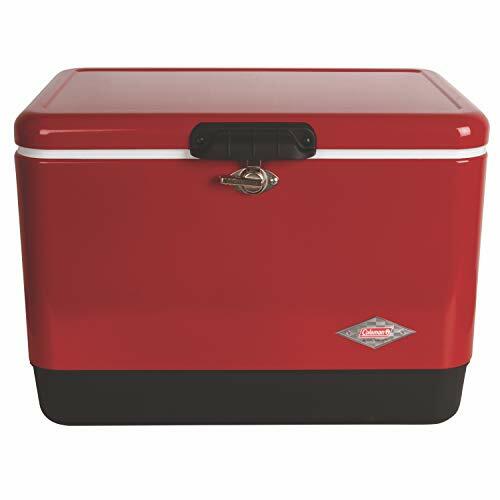 But choosing the best camping cooler can often be a challenging task. In one easy go, you have to take into consideration a series of factors and most importantly, ensure an efficient and economical one. Remember you have to spend days together relying on that cooler alone so a hasty choice may not work. But you can also refer to our list of some of the most dependable options that are available now and then take a pick. We have rated these products on the basis of extensive parameters to bring about the most conclusive options too. 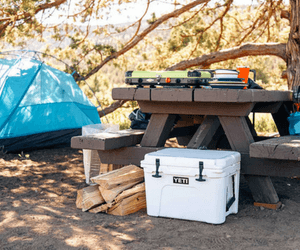 If you are looking for a versatile and a reliable camping cooler, then the Yeti Tundra has to figure prominently in your list of option. In fact, there are many reasons why it is easily one of the best camping cooler. But the most important one is undeniably the versatility of this cooler. It is practically a single device that can offer you maximum satisfaction for any family outing for a couple of days and maybe sometimes even more. 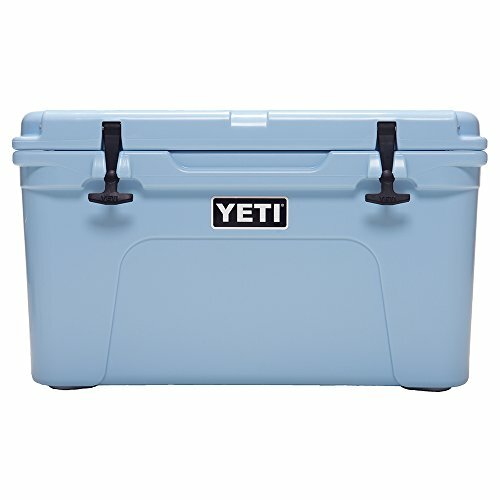 YETI, in fact, has a made a name for itself for coming up with some of the most premium cooler offerings thus far. 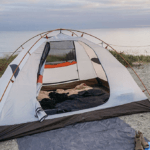 This is equipped with some of the most compelling features that make this cooler effective anywhere from a barbecue party to an outing in the backcountry. With a capacity to hold more than 25 cans, this is the best option when you go out in a group. With 3 inches of PermaFrost Insulation and specially designed FatWall ensures that the ice remains ice for a long time and your can is bear resistant too. 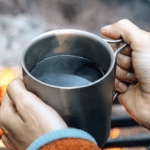 That is undeniably one of the biggest risks of any camping trip. The Rotomolded Construction adds to the cooler’s versatility. It also makes it stronger and functional. 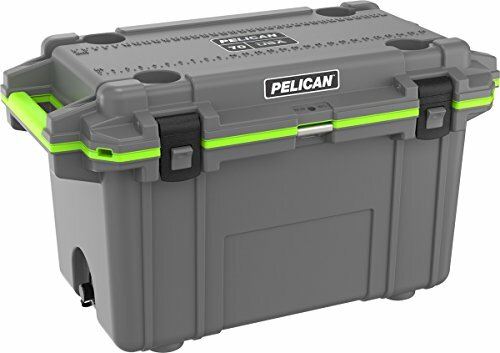 This is a practically indestructible cooler which has the capacity to withstand more or less all types of rigors of a journey. This no doubt makes it a strong and handy cooler to go around. 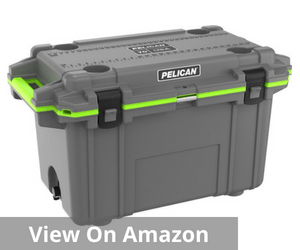 The T-Rex Lid Latches is another reason why you can depend on this cooler more than many others. This is a heavy-duty rubber lock and has a patented technology. That means you can finally relax about the risk of busted locks. This is an effective variant that keeps your stuff safe within even amidst inhospitable terrain. The dry goods basket is another handy feature that adds to the overall user convenience. When fully loaded, it can be really heavy, and perhaps innovations like wheels at the bottom may have helped. But then you are buying it after reading the specs so let’s assume you are prepared for it. 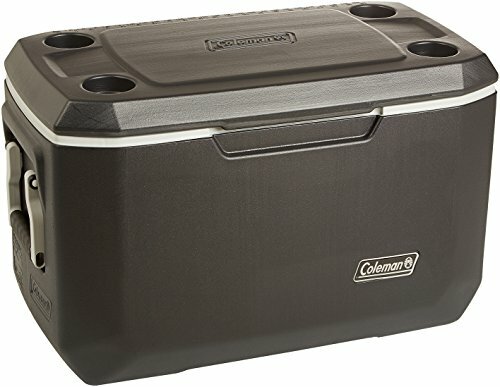 If you are keen about a high capacity low-cost camping cooler, then few others can measure up to the Coleman standards. 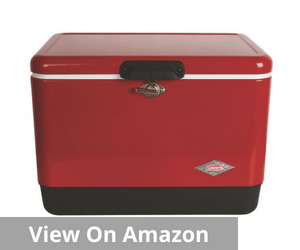 With a capacity to hold more than 100 cans and over 4 soda cases, this 70-quart cooler is one of the most useful and stylishly built camping coolers. 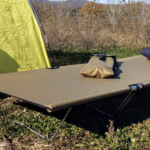 This brand new offering with its trendy outer cover makes it both a functional and a rather good looking piece of luggage on your camping trail. The No-Crush comfort handles make traveling with this cooler rather easy. It makes pinch-free carrying a possibility and enables you to travel without a worry. But the list of conveniences does not end just there. It also has a hinged lid along with four molded cup holders. This works rather effectively to avoid spills and keep your drink close and proper. 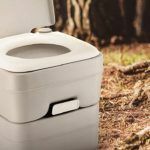 The lid is designed in a way that keeps intact user convenience and concerns together for a long time. The retextured EZ-Clean top makes for relatively easy cleaning and washing. As a result, maintenance of this cooler is never too much of a problem either. 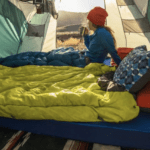 But what really makes it one of the best camping coolers is the fact that it can maintain ice for as many as 5 days even when the outside temperature is close to 90° F (32.22⁰ C). The ThermOZONE™ Insulation that makes it possible also deserves mention because this does not contain any CFCs, HFCs or HCFCs or any other gas that may increase your carbon footprint or result in ozone depletion. This is also a larger cooler with an internal volume of 70 quarts and is known for the superlative ice retention abilities. 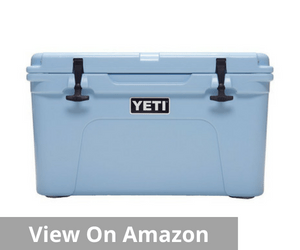 The 2 inch of polyurethane insulation along with a very effective 360 degree freezer-grade gasket ensures that the ice remains ice within this cooler for as many as 10 days at a stretch. In simple words, that means you are pretty much covered for your camping trip. Wherever you may choose to go, your trip is unlikely to last more than that. Some of the best-known features of this cooler include the properly molded handles, the anti-shear hinge system, and molded tie-down slots. That is what makes it a rather convenient cooler to carry outdoors. But no review will be complete without a special mention of the great locking system of this cooler. 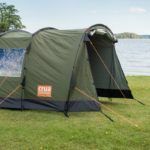 The 3-inch locking latches and the reinforced lockable hasp makes it a rather secure one and also relatively safe in the wild and unpredictable countryside. The stainless steel bottle opener, leak-proof drain plug, 4 self-draining cup holders, integrated measuring board on the lid in centimeters and inches and the non-skid rubber feet are the other key features that make this cooler a standout piece. The leakproof drain plug is actually not very leak-proof and there are quite a few mentions of drain plug concerns from a wide range of users. There is repeated mention of it not being as effective as promised and there doesn’t seem to be an easy solution from the company either. Though a medium capacity cooler, this one is known for the high capacity performance and a definitive edge in terms of efficiency. 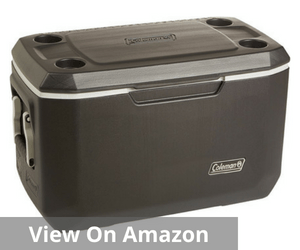 The Coleman 54-quart cooler is undeniably amongst the best camping cooler that you can buy when on a budget. It is effective, versatile, multi-functional and never too heavy to carry despite the huge capacity that it promises to bear. This is a rather heavy duty cooler that also wins accolades for being a good looking retro-style match winner. At 54-quart capacity, this cooler can accommodate up to 85 cans in one go. 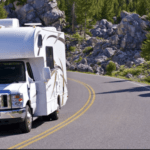 So if you are a small family or group of friends on a 3-4 night trip, this is one of the best options. The efficiency of this cooler can be well gauged by its ice retention ability. 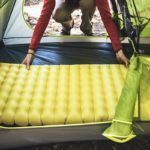 When the outside temperature is above 30-degree centigrade or 90 degrees F, this cooler promises perfect insulation for as many as 4 days. The base material is a rust-resistant stainless steel wonder that is built to perform and wow its users consistently with the brilliance of its ice-retaining capacity as well as the huge storage space that it offers. There are many other features too that add to the consumer convenience. These include comfort-grip steel handles and many others. Not as leak-proof as you may have expected it to be. There is repeated mention of inconsistencies in quality over an extended period of time. 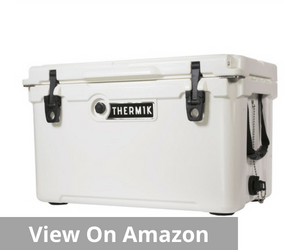 When you are deciding the best camping cooler, the Thermik High Performance surely grabs your attention for the amount of innovation that this one cooler promises. It is not just offering you a functional cooler but one that is full of features that enhance your camping by many degrees. A big positive about this piece is that it is addressing many of the most popular user peeves through these innovations that you see around you. This cooler has a Vacuum release valve that comes is very handy, especially on a multi-day trip. Often you see that the cooler lid gets vacuum sealed after hours in the sun. You have to wrestle with the lid to open it but not anymore. 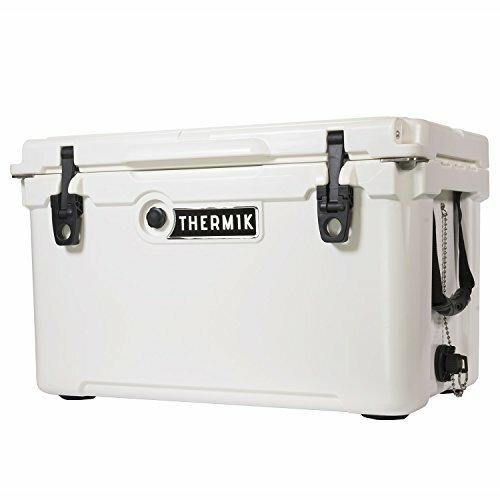 The Thermik High Performance cooler is equipped with this convenient Vacuum release valve that equalizes the pressure inside and frees up the lid almost instantly. This also has an easy ring lever latch that enables a simpler opening and closing of the cooler latch. Moreover, the placement of this latch is very strategic. It ensures that there is no space between the lid and the cooler body. This is crucial as it ensures that you don’t lose a fish that you stored in through the gap. Needless to mention, that this cooler is primarily about making life a lot simpler for its regular users. 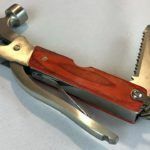 The heavy-duty stainless steel bottle opener makes it easy to open bottles just about anywhere and you do not have to deal with ways to handle tricky bottle locks. The captured drain cap in this cooler is another interesting innovation. This rugged two-stage drain can facilitate remote draining using a standard garden hose. That means draining out this cooler is no longer a cooler. Moreover, the least within stop any type of potential drain overboard as well. The other important accessories in this cooler include a dry basket, drink holder and a cutting board separator. These make the cooler relatively simple to operate, and everything’s available within the user’s easy reach. Select concerns about drain leakage listed by a few customers. But that does not seem to be a recurring issue. One common feature that most great quality cooler manufacturers advertise is leak-proof drains, but if you pay careful attention, there is also the complaint of the bottom drain that most users have highlighted across a wide range of very well crafted and effective water coolers. This is also an important feature for cleaning the cooler effectively. So when you are going out to buy a cooler, check the efficiency of this drain either way. That will determine how much value you can expect from it. Coolers are primarily available in metal or plastic. 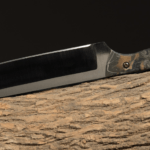 Though the plastic ones look trendier and are molded in an appealing manner, the metal ones, especially the rust-free stainless steel variants perform a lot better than the rest. Especially when you are looking for heavy duty coolers with longer ice retention ability, the metal ones decidedly perform a lot better than the other options. The presence of a proper latch and gasket are very important in any cooler. They don’t just enhance its capacity to retain ice for a longer duration but also make it a more secure option. This also cuts down the chances of a bear attack or a fish sneaking out from a gap between the latch and the top end of the lid. Therefore the best camping cooler is a combination of efficiency, functionality and decidedly design. If you want an affordable but effective cooler for your camping trip, please refer to the ready list complete with detailed reviews. We can assure you that no other guide will help you as much as this one while deciding on a value buy.